We love this pumpkin pie! It's an allergy-friendly pie, and yet nothing is lacking. The pumpkin and spice flavors come through so beautifully and it's not overly sweet. I do recommend a mild-flavored honey — if yours is strong, use all maple syrup. *The coconut crust in Nourishing Traditions is nice, as is this gluten-free nut crust. However, I recommend soaking and then dehydrating the nuts to neutralize enzyme inhibitors, ála Nourishing Traditions. Rinse the almonds very well. Soak them in 3/4 cup of water overnight, or for 8 hours. After the soaking time has elapsed, preheat oven to 350 degrees Fahrenheit. Drain off the almond soaking water, catching it to measure how much. Get out the same amount of fresh water and put it, along with the almonds and all the rest of the ingredients, in a food processor or high power blender (such as VitaMix or BlendTec). Blend until creamy and smooth. Pour into prepared pie crust. Bake for 1 hour or more, until toothpick inserted comes out clean. Let cool to room temperature, then transfer to refrigerator. Refrigerate leftovers. Optional: drizzle with frosting, like Vanilla Coconut Cream Frosting or Vanilla Cream Cheese Frosting. Have you ever made an allergy-friendly pumpkin pie? What's your favorite pie? I think you could do it without a Vita-Mix. Do you have a food processor? That could probably handle the almonds and water. Or, you could also buy Almond Meal (almonds already ground) and proceed from there. You’d have to wing the amount a bit. In any case, I think your family would find the recipe a bit “different” because it doesn’t have the typical pumpkin pie flavor… something to do with having no condensed milk, I think… but we really, really like it! I came looking for the pumpkin pie recipe, but found your whole site/blog inspiring! I’ll be back, and I’m really looking forward to trying the pumpkin pie. My son is on a very restricted diet right now, and may be for some time. I’m still working on learning to sew, and I homeschool my little ones as well. Thanks for sharing your world with us! can this be made without the almonds? I would say only if you can substitute another nut such as cashews or hazelnuts. They need to be ground up with the water to make a nut paste base for the pie filling. Hope this helps! But what do you do if you cannot eat nuts either???? This pie sounds yummy, but I cannot eat eggs, dairy or nuts. Have you seen any other options anywhere? I haven’t seen any other options, but I would definitely experiment. You could try coconut milk (not light) for the almonds and water and thicken it by whisking in some flax seed meal. With this pie, you want the resulting filling to be thick, but the thickness of the filling is flexible, just bake until firm. Another suggestion… try the traditional pumpkin pie recipe, subbing 2 T flax seed meal & 6 T water for the 2 eggs, honey for the sugar, and coconut milk for the evaporated milk. I would reduce the coconut milk by about 1/8 cup to account for the liquid sweeteners. I hope something here will help you. I’d love to know what you figure out! How about substituting soy cream cheese for the nut meal? I bet that would be yummie! I made this yesterday and used stevia instead of the syrups and almond flour and water instead of the almonds. Sooo good! gilliebean – I’m glad to hear it! Would you mind sharing how much almond flour/water you used (and did you soak it?) and how much stevia? I am so glad to see a recipe like this! My son has an egg/nut/fish/shellfish allergy so I’m going to try substituting the almonds with pumpkin seeds. I tried this pumpkin pie recipe with a rice flour & lard crust & is was quite tasty but as stated the texture of the pumpkin isn’t custardy like a traditional pie. I’m making it again this week with a few tweaks… we’ll see how it turns out, I’m aiming for the custard texture while keeping it dairy, soy, egg, & gluten free. This. is SOOOOOO good. Have made it twice this week and will probably go many more rounds before the season is over! I have been making mini-pies in muffin tins with almond meal crust! grab and go, pie? always a “yes”! Do you think soaked brazil nuts would work? 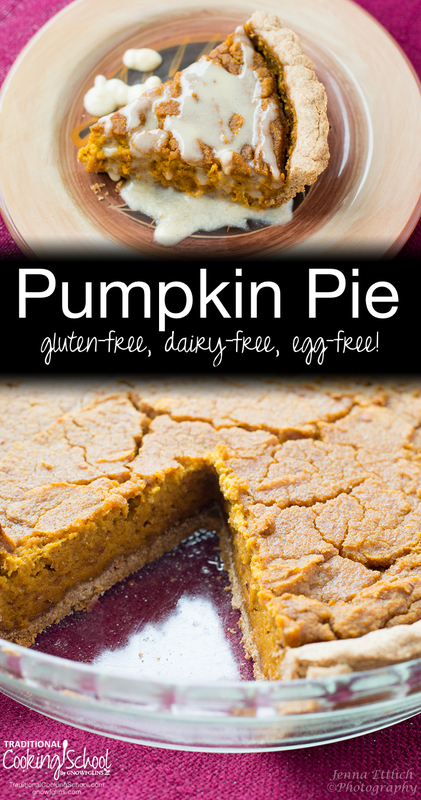 What a treat to find a pumpkin pie recipe without eggs, dairy or gluten. I thought for sure I’d be going without pie this Thanksgiving! Is it possible to use another nut in place of the almonds? My husband is sensitive to almonds, but other nuts are fine.